Know an elderly person who needs a little encouragement? Best-selling author Missy Buchanan, an older adult advocate and a former creativity educator, offers you a bounty of ideas for lifting the spirits of older adults. Her passion for and sensitivity to the needs of elderly persons shine through in this practical book that's packed with simple, creative ways to boost the joy of older adults. 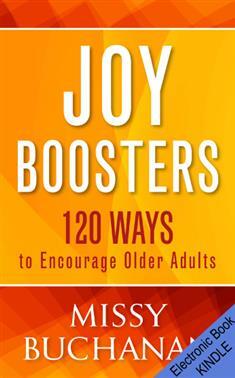 Joy Boosters is perfect for families and friends of older adults, caregivers, senior residence facilities, and churches that want to minister effectively to older adults. Don't miss the opportunity to make someone's day…or week.